Unhealthy Indulgence killed Bruce Lee ? What killed gongfu megastar Bruce Lee 35 years ago ? After the sudden death back in July 1973 of martial art icon Bruce Lee (李小龙), the Hong Kong court and forensics then concluded that he died from cerebral edema (a swelling of the brain caused by a congestion of fluid) in reaction to the painkiller Equagesic given to him by his girl friend and actress Betty Ting Pei. Thus his death was classified as “death by misadventure”. Although his legacy in Hong Kong has been tainted by rumors of drug taking and affairs shortly before his death, Bruce Lee remains an inspiration to many people who had seen his movies, known his profound teachings and philosophies such as “Using no way as way. Having no limitation as limitation” and “All knowledge is ultimately self-knowledge”. His legend lives forever. A survey in a school poll found that Bruce Lee remains the number one male icon among Hong Kong children, finishing ahead of Jackie Chan and David Beckham. To date, all kinds of websites published his life as well rumors that he was killed by Chinese mafia or Shaolin monks, being cursed, haunted by personal ghost, etc. In an interesting twist two weeks ago, Apple Daily of Hong Kong reported that there are 2 other possible reasons for his death. The media had an exclusive interview with an ex-reporter Du Huidong who worked in the same movie production company as Bruce. This senior person supposedly was closely acquainted with Bruce as well as his girlfriend actresses such as Betty Ting Pei and Nora Miao. 1. As Bruce was born in San Francisco, live, educated and worked there, he had known about strengthening muscles using medication. Everyday, he was said to take close to hundred units of vitamins, fast action nutrients, muscle enhancement products, etc. Such over-dosage could have caused his biological system to go haywire. Moreover, everyday, he must drink a big cup of fresh beef banana milkshake and could have compounded the conflicts – yucks ! 2. 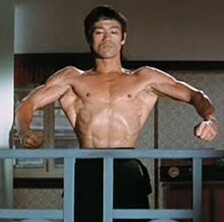 Half a year before his death, Bruce loved to use a Japanese invented electric muscle vibration machine. He was quoted saying that his limit of lifting dumb bells was between 300 to 500 times. After subjecting his muscles to the electric vibration machine for 3 minutes, the exercise effect was more than half a day of his dumb bells lifting. However, this electrical vibration in fact disturbed one’s biological clock and caused the person not to feel any fatigue. The problem will surfaced after a prolonged period. One year after his death, an Indonesia Chinese who had used the same type of machine died of brain hemorrhage. The over-dosage of medication and unorthodox exercising of the human body will certainly backfire on anyone wanting to challenge nature. His death, I believed was a wake-up call for his peers and those who wanted to be like him physically. Today, fortunately there are ubiquitous print and online health information as well as strict control by local health authorities on medication which will prevent such tragedy from ever happening.